This ink is a really neat brown. It flows consistently well, has no problems with cleanup, and is decent on lubrication. It's a really good all-rounder ink if you don't mind it not being permanent. Or, for that matter, water resistant at all. Ghosting: Just a bit, nothing too heavy. Color: 7 - I like it a lot, especially in my Monteverde Invincia with a Pendleton BLS Nib. Its a very nice brown with good shading in this pen. Overall: 7 - This is a brown ink I could see myself returning to! After capturing, I noticed there were bits of these really neat silvery black sheen where the ink pooled up enough. It probably won't be seen unless your pen is REALLY flowing on very ink-resistant paper, but it is there! I'll leave two pictures. One of the sheen circled and one not circled. The pictures do not do it much justice as in real life it sheens much more especially under light. I had real trouble picking up any sheen on my camera. Good review! Thanks!! It's really a good ink, apart from the colour, of course. All of these new GvFCs are very good IMO. Outstanding bottles and boxes and lids, too, which hardly anybody raves about. I think a lot of us disdain the relatively high price, but, man... it is a 75-ml thing! I love this ink. It is my "go to" brown. I have a FC Panther 40 with Matsuyama medium italic nib currently inked with Hazelnut Brown. It has great shading and wonderful sheen. Sometimes, it does take a little longer to dry and can smear a bit. But it is one of my all time favorite inks! It's a great ink! 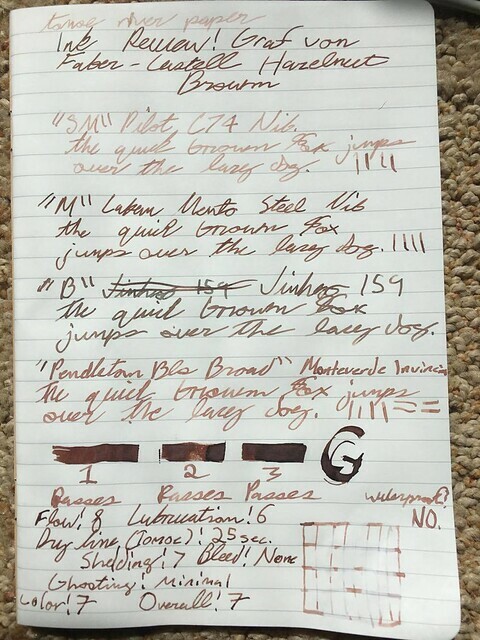 Expect more brown ink reviews soon I got a bunch of samples as I wanted to look into browns that'd mach my recently acquired Laban Mento Turquoise. Brown is a really underestimated color. There are many beautiful shades of brown. This is true! The price point on inks doesn't bother me as much as I know it does for many. It might be because it takes forever for me to run out of but I figure If I'm getting a really well performing ink that'll last me a year or two that price is really worth it. It's interesting to me how some buy Luxury pens without batting as much of an eye but with high priced inks it can be a thing for some people. Don't underestimate the ink! In my experience, a pen is only 50% of the equation. Paper and ink make up the other 50%. If you're treating yourself to a nice pen, treat yourself to a nice ink too. It used to be my favourite brown. Now I prefer earthier ones but I still enjoy it from time to time. .... It's interesting to me how some buy Luxury pens without batting as much of an eye but with high priced inks it can be a thing for some people. Don't underestimate the ink! In my experience, a pen is only 50% of the equation. Paper and ink make up the other 50%. If you're treating yourself to a nice pen, treat yourself to a nice ink too. Amen! I never did understand that myself. For some of the members here, whether the pen costs 1 or 2 K is no big deal, but when they'd rather buy an ink for $10 instead of 20, that beats me. Of course, some people keep their expensive pens behind glass in the showcase so that the price of ink is no question at all. Did you have any flow issues with this ink? The more I use it the more it seems even my best flowing pens have trouble with it. My Laban Mento gets hard starts and my Invincia with a Pendleton stub dries up often.. It works okay at first but then becomes too much for them to keep up with. I'm thinking of lowering the flow score due to this but I'm unsure if I'm just doing something wrong. I've gone through about 14 or so samples of brown inks. The closest to the brown I'm looking for is Diamine Chocolate brown. It's rich, deep dark brown, almost too dark. I need to lighten it maybe one or two shades so it isn't mistaken for a black on a quick glance. I've noticed some browns are close to what I'm looking for on one paper, the they blow it on another paper. I've been using the same pen for all the sample testing, a medium nib to get the full effect of the ink, but I imagine that's going to change some when I go to my usual Fine nibs. Interesting to see what the Diamine Chocolate brown does in a Fine nib. Maybe time to find out. Otherwise the search goes on. It never was my favourite but maybe my third favourite, after Grand Canyon (R. I. P.) and Galileo. I loved this ink sample when I tried it out a while back. I plan to get it eventually. It is very high on my wish list. Its a very underrated ink from what I've seen through my use! As are all the Graf Von Faber-Castell inks. The flow is good, never mind my last post. My Laban Mento is a bit new which I think is why it hard started a bit. One I primed back up my invincia it flowed well again! 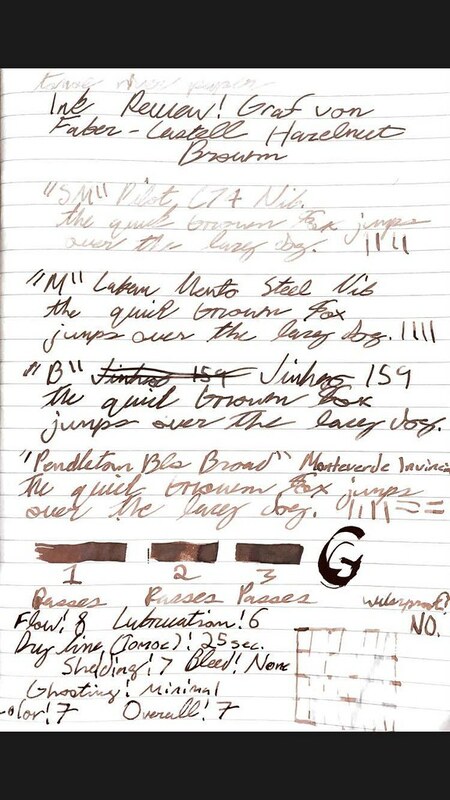 I received a sample in the Goulet Pens collection of brown inks, and it's my favourite by far. I don't know if I like it enough to buy a full bottle, but it's on my list of maybes! After using it a bit more in other pens- indeed this is a dry flowing ink in my personal experience and not too lubricated. Still beautiful! @ lapis: How does this compare to GvFC Grand Canyon? I was able to get a bottle of that on close-out a couple of Christmases ago, and like it (but because it's just the one bottle it doesn't see a lot of use in favor of inks that are easier to get, like Noodler's Walnut). Thank you for the review. Nice saturation and shading, worth trying. I got a sample of this. Tried it in a broad nibbed pen that had flowed well before with Visconti turquoise. The colour was nice and already writing was fine, but any speeding up, or quick lines and it ran dry. I'm now trying a third ink (Diamine eau de nil) and that's fine in the same pen so I can but assume it's the flow level in the GvFC Hazelnut Brown that's the problem. A shame really as I do like it. Indeed, this seems like a very consistent dry ink which is odd for it's price point. I absolutely love the color so it is such a shame. If it were a bit more free flowing It'd be my #1 pick for a brown! I tried the Cognac Brown ink on a medium-sized nib fountain pen and found it too transparent for writing. I hope this one works better for writing!